True story: I once worked for a trade association where one board member physically confronted the employees of another board member’s business. The board member doing the confronting believed the employees were trying to steal business. No one was seriously hurt, and the police didn’t get involved—but it presented serious problems for our trade association. It’s rare, but what do you do when a disagreement between board members escalates into confrontation? 1. Consult your organization’s lawyer—immediately. A serious conflict between board members can put an organization on precarious ground. If your organization doesn’t have existing counsel, find a lawyer who has some knowledge of governance, and find them immediately. If your board is not aware of the conflict between the directors, be sure to inform them through the appropriate procedures required by your organization’s bylaws. It’s a good idea to have consulted a lawyer prior to the first board meeting discussing the conflict, and to share your lawyer’s guidance with your executive committee. 2. Do not pick sides. Directors and staff are not robots. They are human and are prone to human emotion. When the conflict mentioned above occurred in our organization, it was difficult to stay neutral. One board member was clearly in the wrong—which wasn’t made any easier by the fact that the board member also wasn’t very well liked. That said, staying neutral, following any process your organization may have to mediate conflicts and heeding your lawyer’s advice are critical. On an emotional level, it may be impossible—or at least difficult—not to side with a particular board member involved in the conflict. Succumbing to human nature could cause serious harm to your organization, your board of directors, and your career. 3. Be cognizant of organizational politics, and try to mediate a compromise. A disgruntled ex-board member can cause a lot of harm to an organization. Within the bounds of reason, do your best to avoid letting that scenario occur. Getting kicked off a board of directors can potentially be humiliating, and when someone is humiliated their natural response is to lash out. Sometimes a compromise can’t occur, but explore solutions that help everyone involved maintain their dignity and reputation. Failing to do that could lead to disastrous consequences for your organization. There’s a chance a conflict between directors can end up in a legal venue, despite the board’s best efforts to come to a peaceful solution. Creating accurate minutes and maintaining good documentation related to a board’s activities are always important—but documentation becomes especially important in a lawsuit. You will likely need to show what occurred during board meetings prior to and during the conflict. Of course, creating and maintaining accurate minutes and records for your board of directors are important even if two of your board members aren’t threatening to take their conflict out to the playground at 3 o’clock. 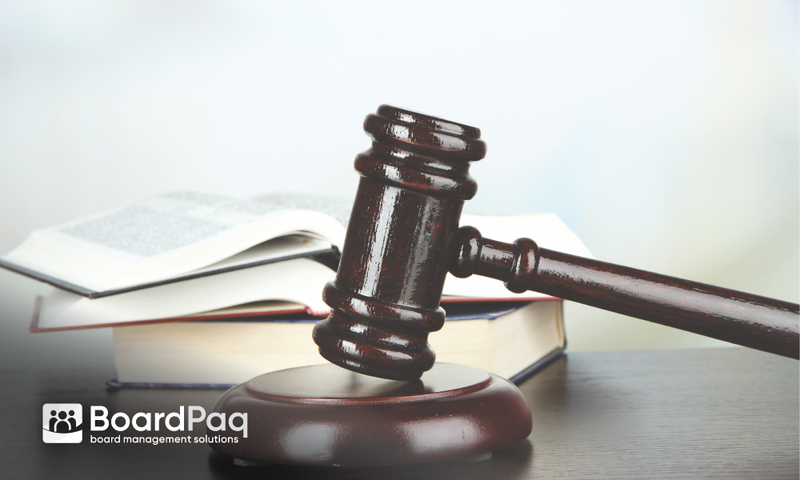 BoardPaq, the board portal of choice for cost-conscious organizations, helps you do just that. Our suite of tools ensures your board of directors has accurate documentation of meetings and decisions. Most boards never experience serious conflicts between directors—but it can happen. When it does, be sure you consult your lawyer, follow the process, try to create compromise, and have accurately documented your board meetings.